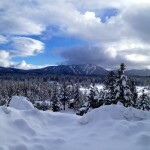 Want to ski without the Squaw Valley crowds? Then check out our midweek deal. Staying more than four nights? Then check out our Winter Promotion 25% off deal! Want to play hooky, get away with friends, AND save on skiing and lodging? Then check out our 4 Pack deal! There’s something for everyone….that is, if you like winter savings! • Stay two midweek nights and the third midweek night is FREE! The 3rd Night Free promotion is valid January 6- April 14, 2013. Guests must purchase 2 midweek nights to be eligible for 3rd midweek free night. Weekend nights are not included. For stays greater than 3 nights, other discounts or promotions may be available. Promotions are subject to availability, change, blackout dates and nightly minimums. Blackout dates: February 15-23, March 12-14,2013. Not valid with any other promotional offer. Squaw Valley Lodge Winter Promotion – Save up to 25%! • Rates start at $157 per night for a Deluxe Studio Condominium and $224 per night for a townhouse-style Loft Condominium. • Save 15% on reservations of less than 4 nights. • Save 25% on reservations of 4 or more nights. The Winter Reserve Early Promotion is subject to availability, change, blackout dates and nightly minimums. Valid January 6- April 14, 2013. Current blackouts are February 1-2, 7-9, February 15-23, 2013 and March 4-8, 2013. Quoted per night rates are midweek for 4 or more nights with the 25% promotional discount. Not valid with any other promotional offer. Midweek Ski and Stay Package: The 4 Pack is Back! • Play hooky with a group of friends–you deserve it. • Enjoy three midweek nights lodging in a spacious Loft Condominium with two days of skiing or snowboarding at Squaw Valley and Alpine Meadows. • $439 per night or $110 per person/per night for 4 people. Promotions are valid through April 30, 2013. Promotions may not be combined and are not valid with any other promotional offer. All rates quoted are midweek rates and do not include 10% County Occupancy Tax. Current blackout dates include January 18-20, 25 & 26; February 1, 2, 9,10 and 15 through 23; March 1 & 2. Promotions are subject to availability, nightly minimums, additional blackout dates and change. 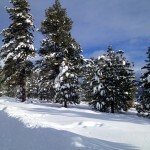 Remember, at Squaw Valley Lodge, there are no additional Resort Fees, unlike other Squaw Valley lodging accommodations. 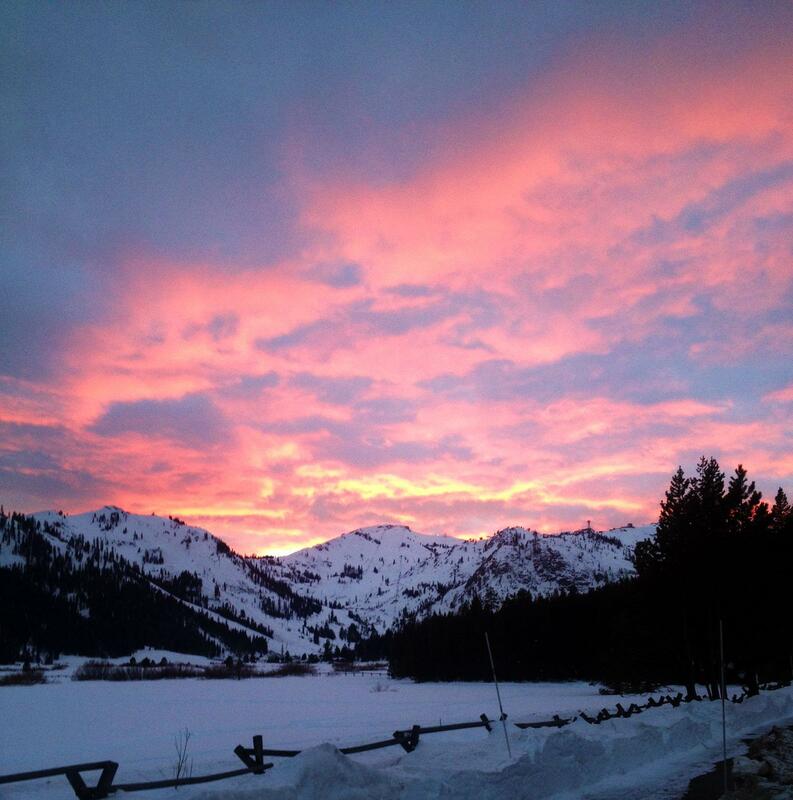 Photo Credit Squaw Valley PR. Looking for a unique skiing experience? Then look no further! A Nachtspektakel (pronounced knocked-shpeck-tockle) is a traditional European-style ski event that is actually a cultural norm in Europe. It’s a genius idea that combines skiing, drinking and eating. So why not spend a Saturday evening skinning up Squaw Valley to High Camp, meeting new friends who enjoy the sport, and top off the night with drinks and dinner? • Saturday, February 9 at 3pm. Meet at the Tram at 2:30pm. • $50 in advance at Alpenglow Sports | $60 day-of, on-site. • Alpenglow Sports offers free rentals all day for the tour. Must be picked up by 1pm. Rental gear can be returned at the end of the tour at the event, or at the shop the next day. • Make sure you dress appropriately with warm uphill gear, skis, skins, boots, poles and headlamp! Consider bringing a change of clothes for drinks and dinner afterward at High Camp. Do you love skiing? Do you want to take your skills to the next level? Say goodbye to bunny hills and hello to black diamonds. 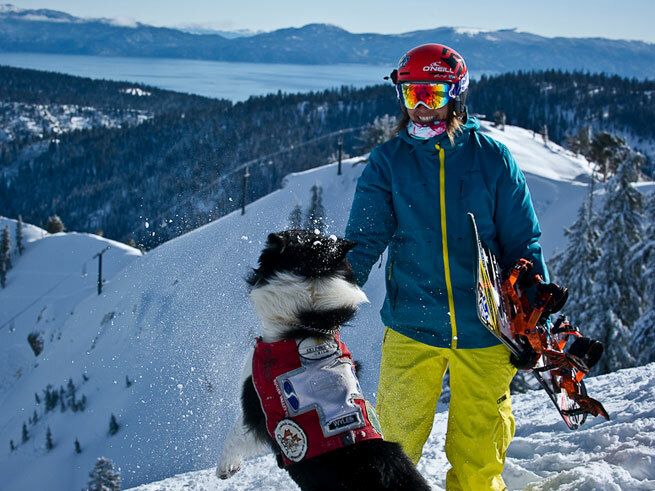 Take part in Squaw Valley’s newest and most innovative women’s skiing program: Women of Winter (WOW). WOW will improve your skiing skills, build your confidence, and inspire you to take on new challenges. This exciting program is perfect for advanced female skiiers who love to ski, yet have hit a plateau in their abilities. The experience involves a ton of skiing, whether you sign up for a 2 ½ hour session or a 3-day immersive program. Learn from top pros who will take it to you, both mentally and physically. WOW offers Wednesday programs for advanced and expert women looking to improve their performance on black diamond ski runs. 3-Day programs are designed for Strong Intermediate skiers, advanced skiers, and experts. The WOW pros invite you bring the mountain to its knees and conquer your fears. Participants are asked to meet in front of the Funitel 15 minutes before lesson time. 3-Day Camp programs begin with a Tuesday night orientation and ends on Friday afternoon. This features full days of skiing. 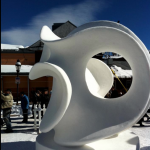 To purchase individual or group tickets, visit squaw.com/things-to-do/events-calendar/women-winter-2013. 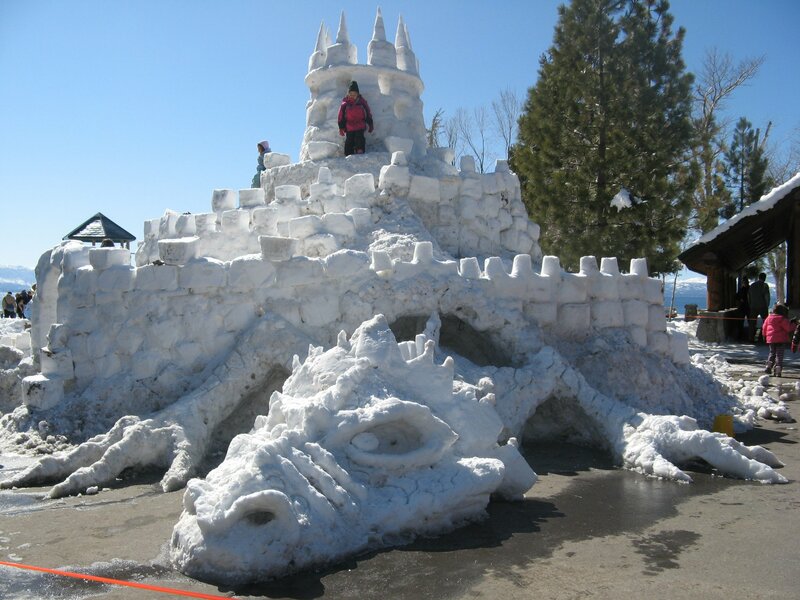 Kings Beach Snow Sculptures are a must-see during Snowfest! 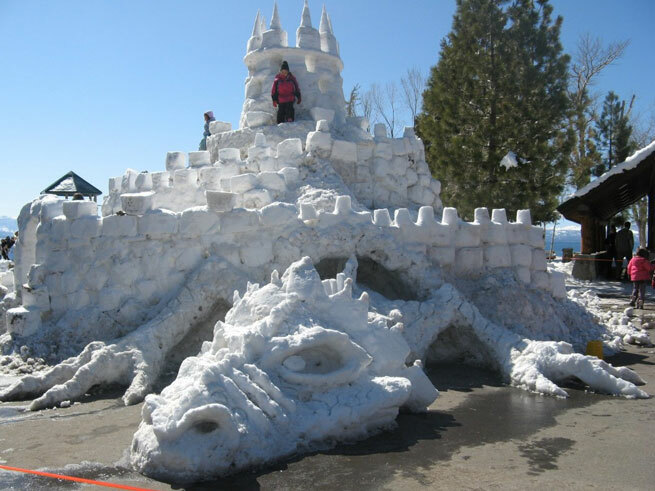 What would winter in Lake Tahoe be without the North Lake Tahoe Snowfest? It’s time to mark your calendars for Snowfest! 2013, which will take place March 1-10. • On mountain torchlight parade! 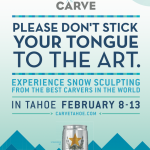 February 8-13, the best snow carvers from around the world descend on Northstar California Resort to sculpt masterpieces out of 20-ton blocks of snow! An award ceremony takes place on February 13. The event is free and open to the public for the whole week. 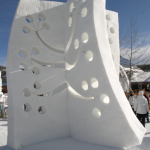 Have you ever seen a snow sculpture like this in person? 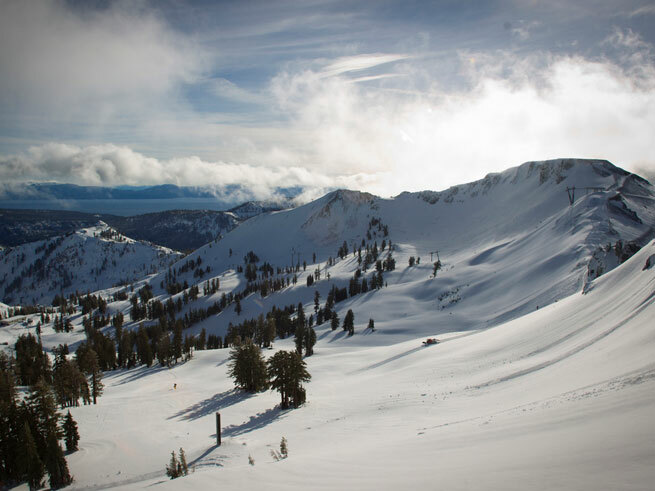 Imagine looking down an immaculate mountainside of fresh snow with nothing in sight but the tip of your skis and majestic blue waters of Lake Tahoe lingering in the distance. 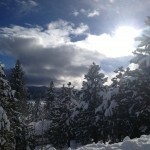 And as the sun slowly creeps its way towards high noon, you see endless stretches powdery snow blanketing the mountain. Sign up for Dawn Patrol and experience the magnificence of Squaw Valley Resort’s early morning skiing adventures. Dawn Patrollers receive exclusive early access to the slopes of the Links, Shirley Lake and Granite Chief. Enjoy the privilege of being the first explorer to carve your way through the fresh powder or untouched corduroy depending on the weather. 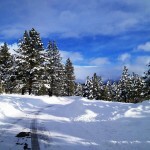 This is a unique opportunity dote upon yourself the splendor of the Sierra Nevada Mountains, the vast beauty of Lake Tahoe, and the thrill gliding down a mountain on your skis over a pillow of fresh powder snow. Squaw Valley Lodge will offer Dawn Patrol on Saturday and Sunday mornings from now to February 10th, 2013. Tickets for adults $29, tickets for youth (ages 13-22) are $19, and children (ages 5-12) are $12. 2012-2013 Gold Passholders received two free tickets and a 50% discount after that. 2012-2013 Silver, Bronze, and College Passholders received a 50% off discount. Tickets are available for purchase at the Tram building at 7:30 A.M. For reservations to Squaw Valley Lodge call (855) 549-6742 or email info@squawvalleylodge.com. With 21 feet of powder for the 2012/13 season thus far, holiday skiers and boarders were treated to 85 inches of fresh snow in only 5 day over Christmas and New Year’s! January is a great time to ski, board, snowshoe, cross-country ski, or enjoy a day of sledding or tubing with the kiddos! Save up to 25% on our Winter Reserve Early Promotion! Remember, at Squaw Valley Lodge you will pay ZERO resort fees! Click HERE for details.